There’s no better way to enjoy fall’s abundant apple harvest than in a towering deep-dish pie. Unfortunately, this dessert often yields unevenly cooked, shrunken apples swimming in an ocean of their own exuded juices atop a pale, soggy crust. 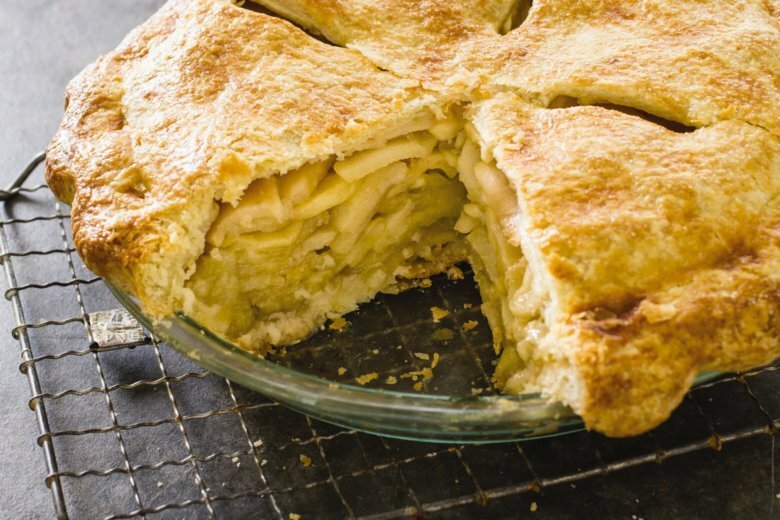 We wanted each slice to be dense with juicy apples, framed by a buttery, flaky crust. A combination of sweet and tart apples, tossed with a little brown sugar, salt, lemon, and cinnamon, promised a perfectly balanced filling. Precooking the apples solved the shrinking problem, helping them hold their shape in the oven while also eliminating any excess liquid, and thereby protecting the bottom crust. We mounded the cooled slices in our pie plate, covered them in the top crust, and baked. Our sky-high apple pie emerged golden brown and chock-full of tender apples, filling our kitchen with the homey, comforting aromas of this autumn favorite. Good choices for tart apples are Granny Smiths, Empires, or Cortlands; for sweet we recommend Golden Delicious, Jonagolds, or Braeburns. Serve with vanilla ice cream. Roll 1 disk of dough into 12-inch circle on lightly floured work surface, then fit into 9-inch pie plate, letting excess dough hang over edge; cover with plastic wrap and refrigerate for 30 minutes. Roll other disk of dough into 12-inch circle on lightly floured work surface, then transfer to parchment-lined baking sheet; cover with plastic wrap and refrigerate for 30 minutes. Toss apples, 1/2 cup granulated sugar, brown sugar, lemon zest, salt, and cinnamon together in Dutch oven. Cover and cook over medium heat, stirring frequently, until apples are tender when poked with fork but still hold their shape, 15 to 20 minutes. Transfer apples and their juice to rimmed baking sheet and let cool to room temperature, about 30 minutes. Adjust oven rack to lowest position and heat oven to 425 F. Drain cooled apples thoroughly in colander set over bowl, reserving 1/4 cup juice. Stir lemon juice into reserved 1/4 cup apple juice. Spread apples into dough-lined pie plate, mounding them slightly in middle, and drizzle with lemon juice mixture. Loosely roll second piece of dough around rolling pin and gently unroll it over pie. Trim, fold, and crimp edges and cut 4 vent holes in top. Brush dough with egg white and sprinkle with remaining 1 tablespoon sugar. Place pie on rimmed baking sheet and bake until crust is golden, about 25 minutes. Reduce oven temperature to 375 F, rotate sheet, and continue to bake until juices are bubbling and crust is deep golden brown, 30 to 40 minutes longer. Let pie cool on wire rack until filling has set, about 2 hours; serve slightly warm or at room temperature. Process flour, sugar, and salt in food processor until combined. Scatter shortening over top and process until mixture resembles coarse cornmeal, about 10 seconds. Scatter butter pieces over top and pulse until mixture resembles coarse crumbs, about 10 pulses. Transfer mixture to large bowl. Sprinkle 6 tablespoons ice water over mixture. Stir and press dough together, using stiff rubber spatula, until dough sticks together. If dough does not come together, stir in remaining water, 1 tablespoon at a time, until it does. Divide dough into 2 even pieces. Turn each piece of dough onto sheet of plastic wrap and flatten each into 4-inch disk. Wrap each piece tightly in plastic wrap and refrigerate for 1 hour. Before rolling dough out, let sit on counter to soften slightly, about 10 minutes. Nutrition information per serving: 525 calories; 270 calories from fat; 30 g fat (14 g saturated; 1 g trans fats); 73 mg cholesterol; 380 mg sodium; 62 g carbohydrate; 7 g fiber; 50 g sugar; 2 g protein.